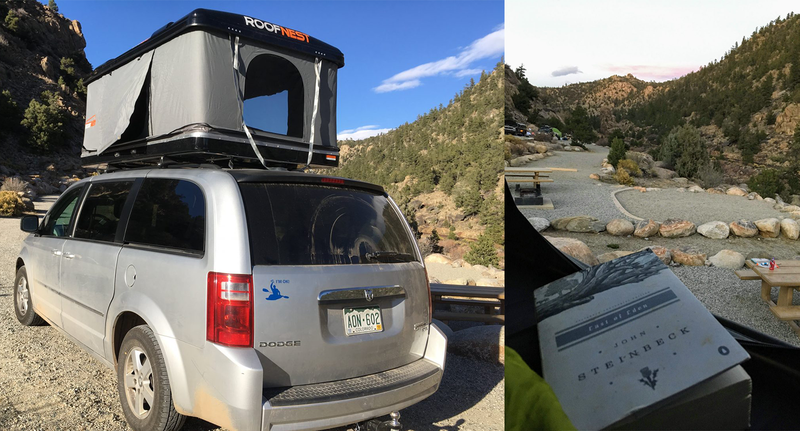 I tested Roofnest’s hard shell roof top tent with my family of five. Here’s how it went. 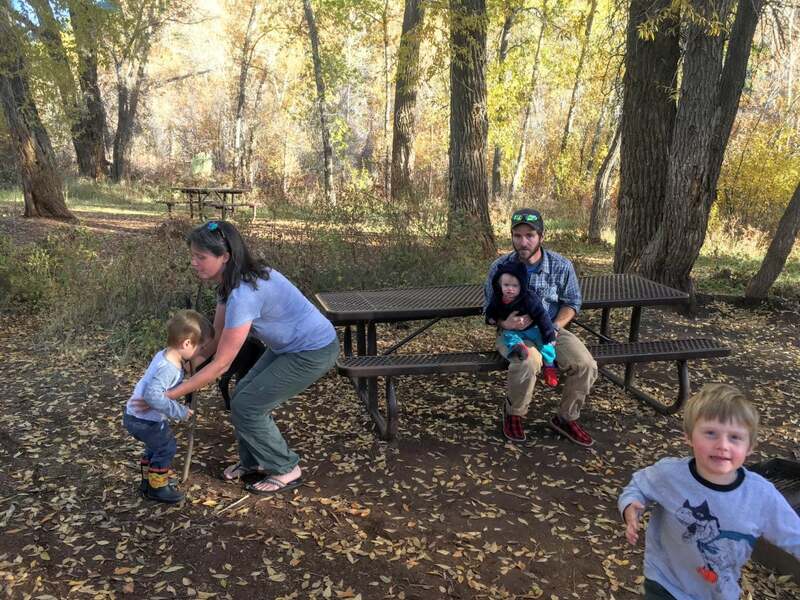 Our family loves fall camping. For us, it’s a season to rest and catch our breath between summer chaos and winter in a mountain town. We get to spend time together as a family, and we always spend it best in the outdoors. 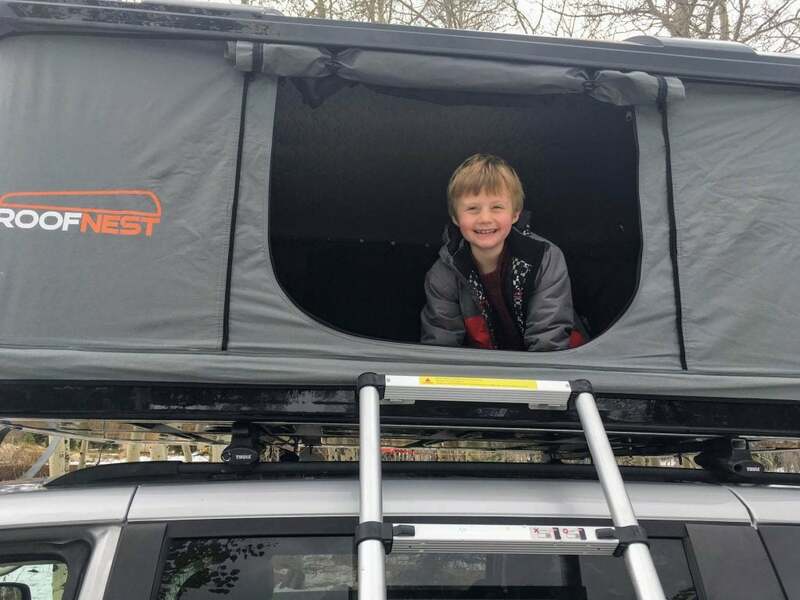 With three kids under six, the wide world of car camping opens to us, and this year, I was lucky enough to demo Roofnest’s new Eagle roof top tent, the premier hard shell roof top tent on the market. In the spirit of full disclosure, I may have been one of those traditionalists who openly questioned why anyone would want to sleep on TOP of their car. What’s wrong with sleeping in the dirt, thankyouverymuch? So I went into the experience looking forward to the adventure, but a little skeptical. The tent itself turned out to be awesome, and although it probably makes more sense for slightly smaller families, I discovered a lot of potential in this unique camping option. 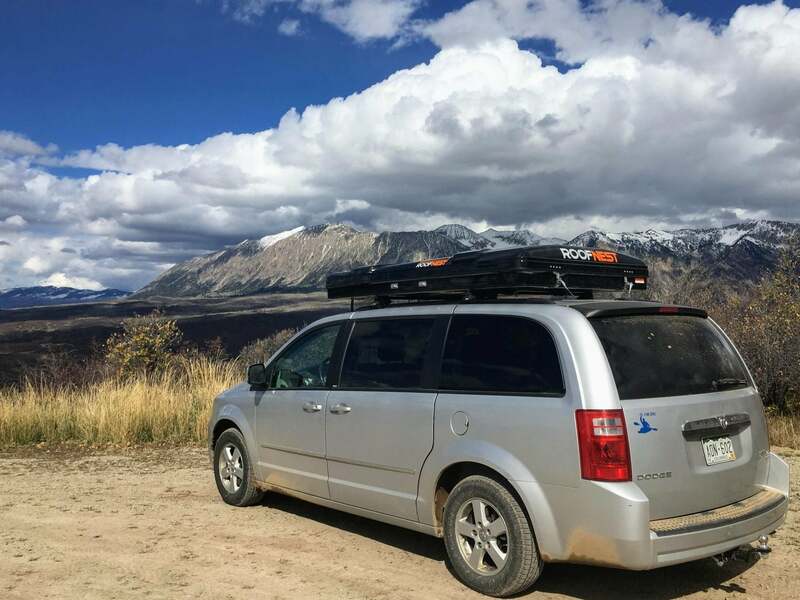 Our 2010 Dodge Grand Caravan came with factory installed rails, and we had to scramble to find some Thule Crossbars for the best mount. But once those were on, the installation process went very smoothly. With three of us, and my kindergartner supervising, we were able to lift the hard shell roof top tent onto the van. The fiberglass case adds some weight; overall it is slightly less than 150 lbs. However, it makes up for that weight with decreased air-resistance. More on that below. The tent attaches to the crossbars with a simple crews-and-brackets mount underneath. These brackets seem like they would be adaptable to different kinds of sport rack crossbars, and we adjusted the placement with no problem. The simplicity of the installation was a welcome relief. I should mention though, that it is crucial to check the tightness of the screws and brackets after every trip. We had to adjust and re-tighten several times throughout the two weeks we had it. The reduced wind-resistance is where the Roofnest approach to the hard shell roof top tent really outshines its competitors. We took this baby everywhere. From Crested Butte to Glenwood Springs we drove for an hour and a half over a VERY rutted and washboard covered Kebler Pass. On our way out to the Dominguez-Escalante Canyon region past Grand Junction, we traveled I-70 at 75 mph. (The safety recommendation clearly says ‘don’t travel over 120 kph’). 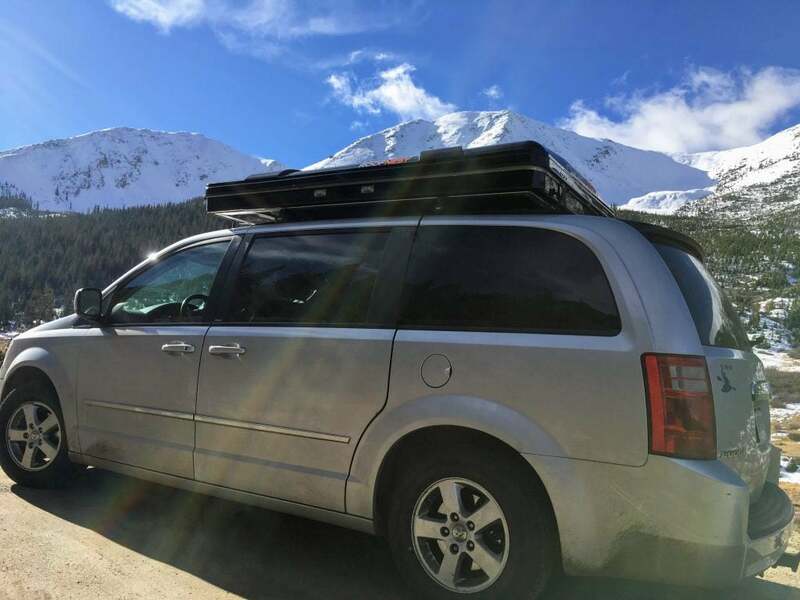 And then for my last trip, I took it solo over Independence Pass by Aspen which climbs terrifying switchbacks to top out at around 12,000 ft.
With all of this varied terrain, the ride was smooth. 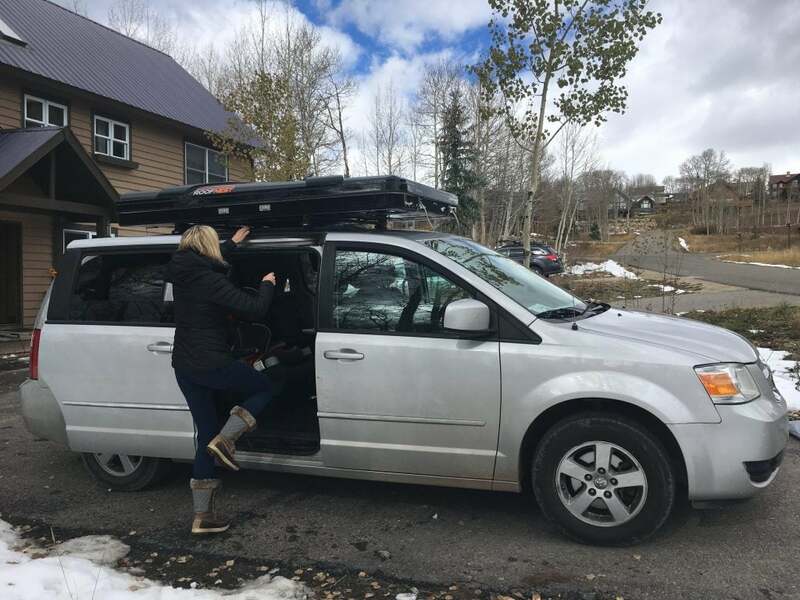 Sometimes the cornering felt a little top-heavy, but that might have just been our minivan. Overall we probably lost a little on gas mileage, but not enough to be problematic. Setting up the Roofnest tent took literally one minute once we got to our campsite. You simply detach the four cam straps, gently shove the roof up, and the small hydraulic arms in all four corners of the tent do the rest. 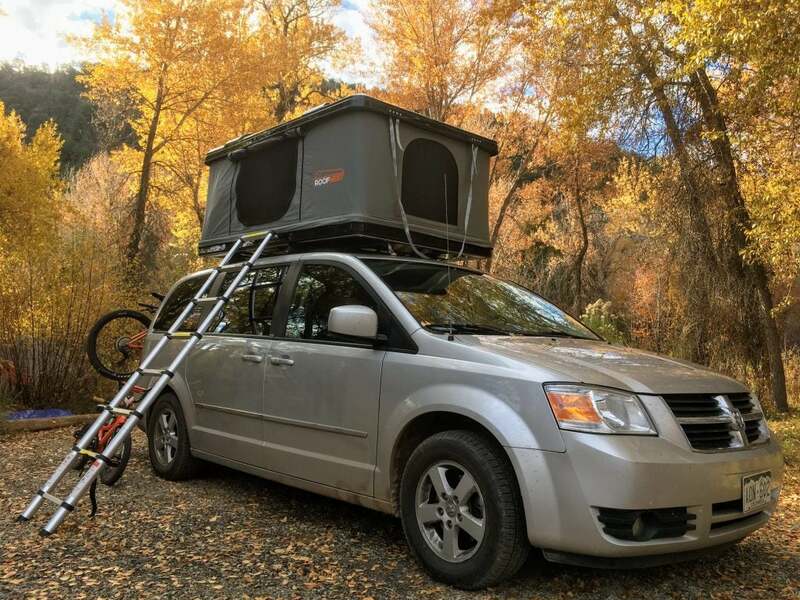 Once it’s open, you click the telescoping ladder into place and toss your sleeping bags onto the two-inch thick mattress. Admittedly, this is where the car-top tent camping style beats sleeping in the dirt. The hard shell roof top tent is effortless to set up once you’ve reached your campground, and it offers a nice sense of security that you don’t really have in a tent. You can leave all your sleeping bags and pillows set up when you collapse the tent. This means that any time you and the family want to change locations, you simply pull the roof down, attach the small cam straps for full closure, drive to a new spot, then pop it up again. 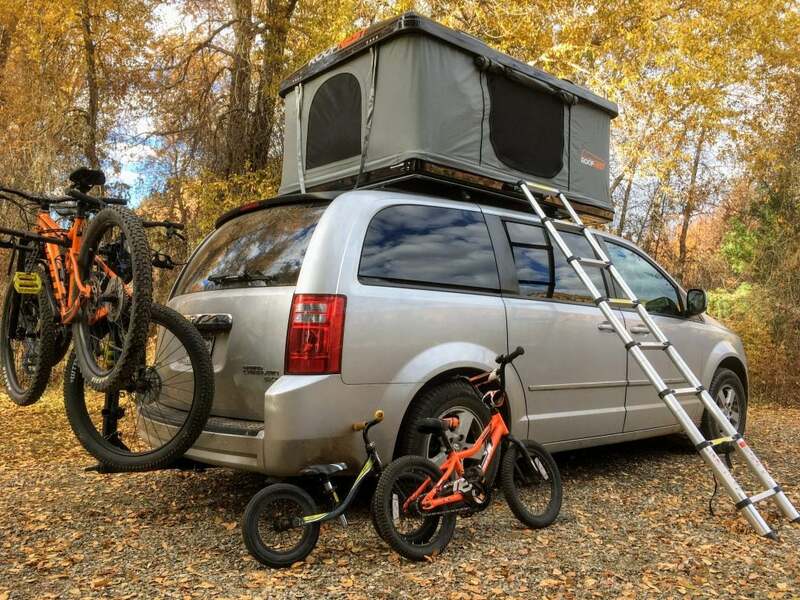 For a parent who wants to take her kids camping all the time, but whose partner is often busy, this is a great solution. Beds are totally made the moment you show up at a site, and for a busy family that can barely keep everyone together for a family picture (see above), the Roofnest tent stow-and-go style is a major win. I did wonder about the ladder angle. I couldn’t find information about whether it was safe to leave it not fully extended to provide a more direct climb up. As it was, the rungs on the ladder were at a bad angle for bare feet. I didn’t have to worry about building my own tent, or looking for a good spot. I found myself a site at Hecla Junction Campground which only has gravel-bottomed sites—not ideal for ground tent campers, but just fine for me. With no time wasted on pitching a tent, I hiked up a beautiful side canyon, then made dinner and read a book for three hours. The Arkansas River provided lovely background noise, and the morning was a quick tear-down before hitting the road. Did I mention we have three kids? Right, well—they are all adorable, but they are young and I constantly worry about them getting cold when we’re camping. On the first night of our family camping trip we separated, thinking there wouldn’t be enough space in the Roofnest tent. 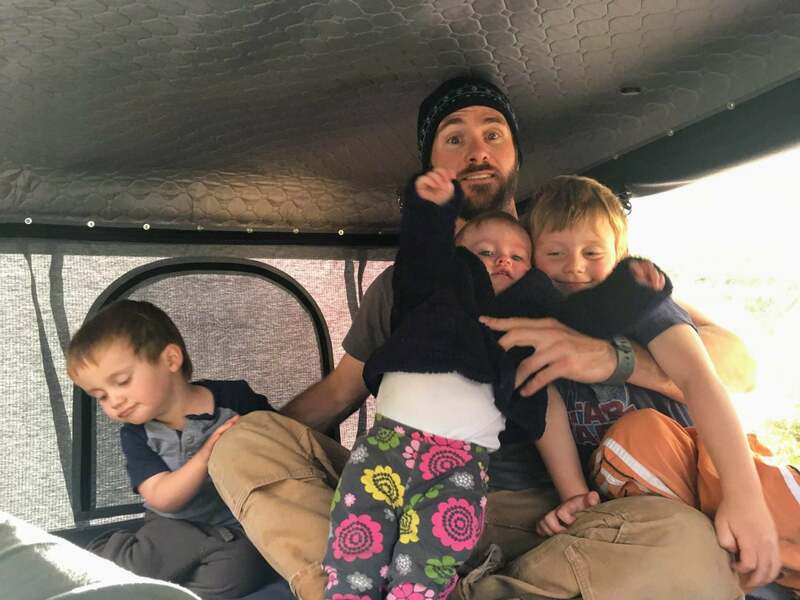 I took the baby (14 months) in the normal tent, and my husband took the boys (2 and 5) up the ladder to enjoy the hard shell roof top tent. This was not a good decision. While the baby girl was warm in her Columbia bunting, I was not. It dropped below freezing overnight, so Little C and I climbed up with the boys around 5 AM. Then we all got nice and toasty. The next night, we played a little Tetris so all five of us could spend the whole night in the Roofnest. Verdict: Two adults and three kids actually fit inside this thing! The boys slept like rocks. My husband and I stayed warm, and Little C didn’t wake up any more than usual. I love that there is a mattress in the bottom, although if you have back issues, you should still bring a sleeping pad since there is not a lot of support. One problem with the overall construction of the Eagle is the long webbing handles for pulling the roof down. They flap in the wind and are quite loud inside the tent. One night, I had to get out and daisy-chain them to get any sleep. The other minor issue is that the water-proof and durable materials for the tent walls is quite opaque. So if it is too cold to open the mesh windows, the tent stays very dark in the mornings and evenings, even though it is light outside. Of course, if you were a normal human being who was allowed to sleep in…ever…this might actually be a bonus. Although I loved our time with the Roofnest Eagle, our family, with an eighty-pound dog, is too big to camp regularly in this particular device. I think the price point may also be a little high for some families, at almost $2700 for the larger model. And it definitely needs a washable mattress cover. If, however, I did more camping with the kids when it was just me, this would make perfect sense. And the tent itself provides hours of fort-like entertainment. 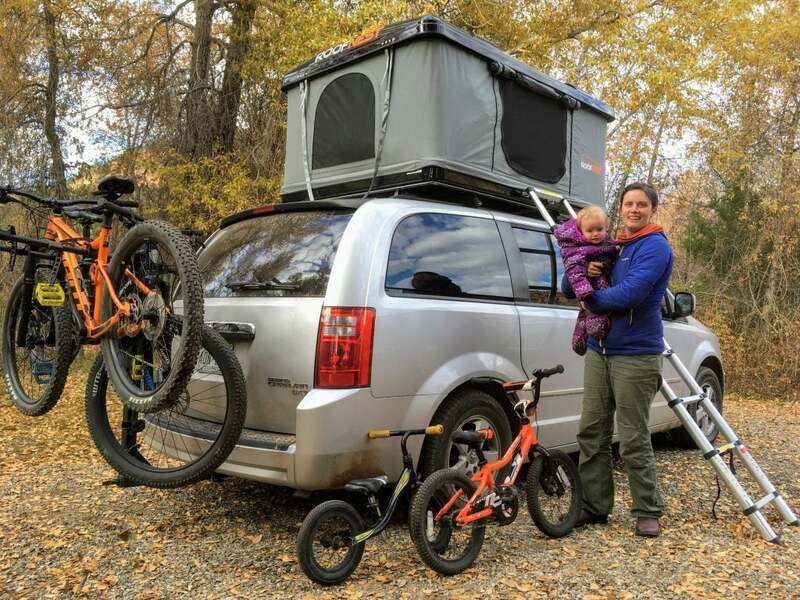 Family adventures on top of a mini-van don’t get much better than this, though, and a hard shell roof top tent really opens up the possibilities.